Liberty's Light by Rod Chase ~ Being a photo-realist, I am very dependent on finding accurate reference materials for each painting. It is not always easy, but I've found the National Archives to be a treasure trove - especially for early photos of Washington. I especially enjoyed working out how to feature the gas lights. 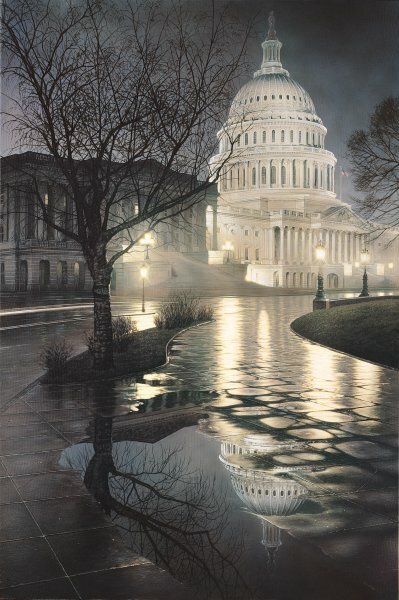 Although the Capitol dome was lighted by electricity in 1919, the lamps outside were gas, giving the whole scene a misty, moody glow. And by the way, the inset on the gold-framed paper print says, "One Nation, Under God."